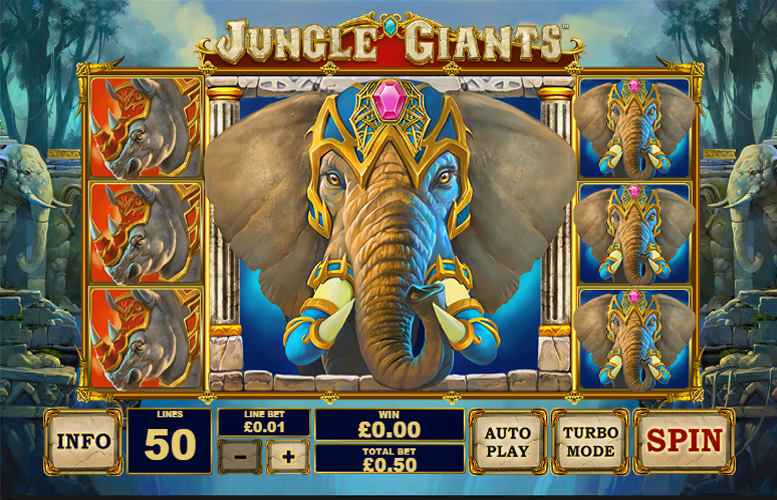 The Jungle Giants slot machine from Playtech is an excellently titled game from one of the industry’s best-known designers. Everything about this slot seems to have been amplified, which is appropriate, of course, considering we’re in the presence of giants from the jungle. The symbols can appear in massive blocks of nine, the main game prizes are huge, and the upper betting limit is enormous. 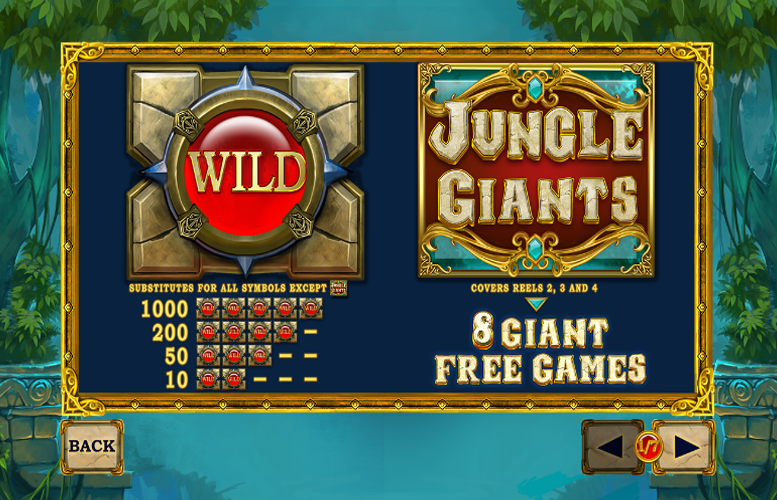 Jungle Giants has a couple of cool special features that can result in some massive prizes too. We particularly enjoyed the prospect of dropping a cool 50,000x the player’s line bet on any one spin! Let’s see what else makes this one such a great title. Visually very impressive. The symbols representing the majestic beasts of the jungle look amazing! Massive upper betting limit. Jungle Giants will appeal to all levels of players – even the high rollers. Great, thematically-relevant bonus features, prizes, and symbol designs – we’re dealing with the giants of the jungle here so everything about the game is big! Huge potential jackpot win. It’s rare to see a machine that will pay players 50,000x their line bet! Perhaps an additional bonus feature would make this slot machine even stronger. 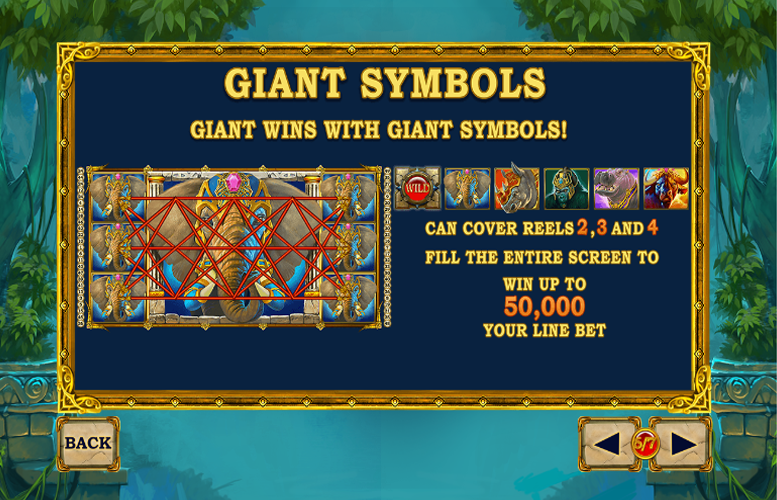 The top jackpots on the Jungle Giants slot machine are all awarded for what the slot terms ‘Giant Symbols’. Basically if you fill the screen with all the same symbol you can win 50,000x your line bet. Matching five of the same animal symbols along one of the 50 fixed win lines produces the other wins. Each of these creatures is one of the largest mammals on the planet, meaning the title of the slot is relevant to both the artwork and special features, amongst other things. “Wild” = 1,000x the line bet. Elephant = 150x the line bet. Rhino = 100x the line bet. Gorilla = 75x the line bet. Hippo = 50x the line bet. Wildebeest = 50x the line bet. 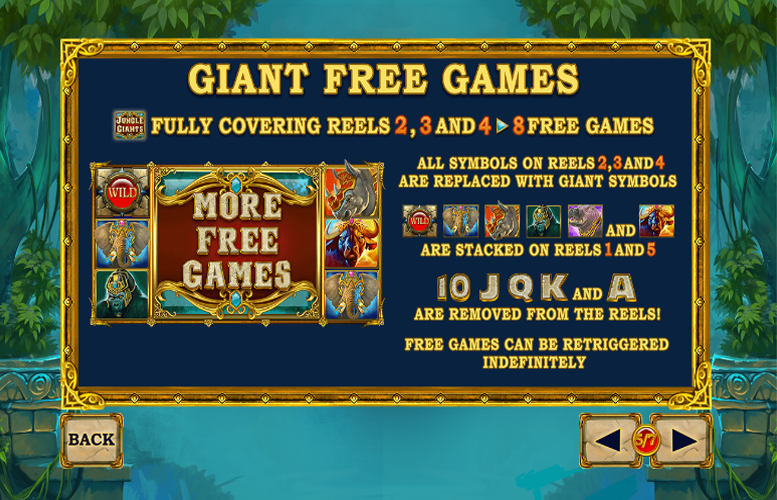 Landing three Jungle Giants “Scatter” symbols covering reels two, three, and four will award players with eight free games. During these free spins, all symbols on reels two, three, and four are replaced with giant symbols. As if that wasn’t juicy enough, the “Wild”, Elephant, Rhino, Gorilla, Hippo, and Wildebeest symbols are also stacked on reels one and five. This can make for some truly epic winning combinations. Players should note that these free games can be retriggered indefinitely. It’s not just the animals that are represented by the game’s symbols that are some of the biggest around on Jungle Giants. Massive three by three animal symbols can cover reels two, three, and four. 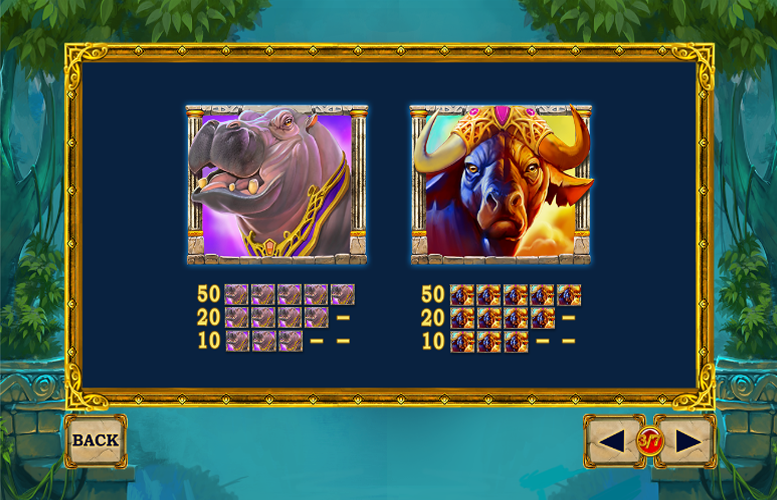 If players manage to fill the entire screen with the same animal or “wild” symbol, they will be awarded with a massive 50,000x their chosen line bet! In addition to the game’s giant animal symbols there are also some symbols that don’t represent such large prizes. As is common on slot machines these days, these are represented by the upper end of a standard deck of playing cards (A, K, Q, J, 10). Ace = 30x the line bet. King = 30x the line bet. Queen = 20x the line bet. Jack = 20x the line bet. Ten = 20x the line bet. The number of win lines on Jungle Giants is fixed at 50. This means that players are only able to adjust the amount bet on each of the win lines. Here, the minimum value is just 1p and the maximum is £50. This means that that the lowest possible bet per spin is just 50p. Meanwhile, the largest is a hugely impressive £2,500. Evidently, the Playtech design team decided to make everything about this title giant! 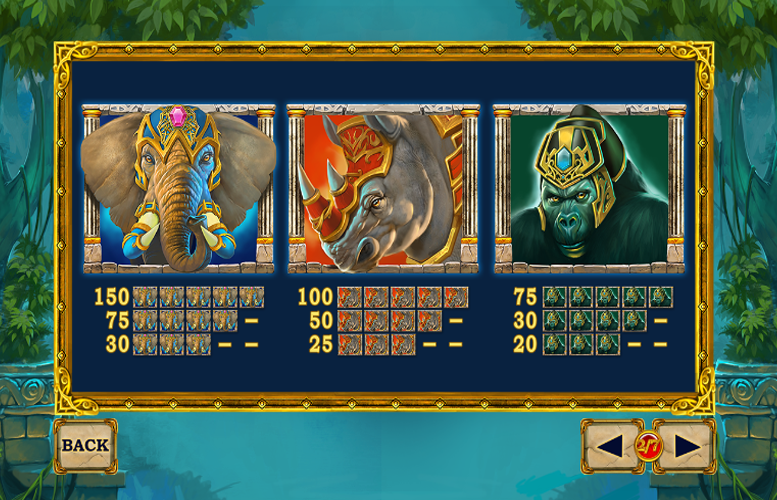 Playtech’s Jungle Giants is an impressive game from one the industry’s best teams. There isn’t a lot to dislike about the game, truth be told. It offers players an innovative way to win some truly massive prizes. What’s more, all levels of player are catered for, right from the micro-stakes of 50p per spin, up to the nose-bleed level of £2,500. If players were to drop the game’s highly lucrative jackpot whilst wagering such a massive amount, the total prize awarded would be staggering! The only real fault we managed to come up with for the Jungle Giants game is that perhaps there could be an additional bonus feature. This is striving for perfection, however. The title offers more than enough in terms of excitement with the features already present. This game has a rating of 5 / 5 with 802 total reviews by the users.